The winner is one of several Sarahs. I included a screenshot of the winning comment to hopefully avoid confusion. Please contact me at kansascouture@gmail.com as soon as possible to claim your prize. 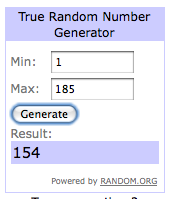 Thanks, everyone for entering! Love the color of your skirt! Great necklace too!